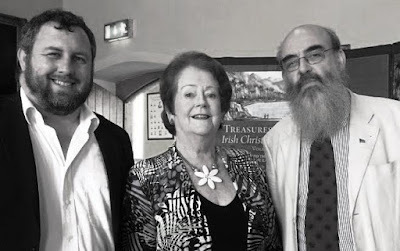 Professor Salvador Ryan, editor of Treasures of Irish Christianity Volume III, Mrs Mary O’Rourke, who launched the book in Maynooth, and Revd Professor Patrick Comerford, author of two chapters in the new book. The stories of Church of Ireland missionaries feature prominently in the third volume of Treasures of Irish Christianity, which was launched recently [4 July 2015] in Saint Patrick’s College, Maynooth, by the former Minister for Education, Mrs Mary O’Rourke. Treasures of Irish Christianity Volume III, To the Ends of the Earth, looks at “the Irish abroad,” with a special emphasis on the historical contribution of Irish missionaries. This volume also marks the 1,400th anniversary of the death of Saint Columbanus, the Irish missionary who founded monasteries in the Frankish and Lombard kingdoms. The Revd Canon Professor Patrick Comerford of the Church of Ireland Theological Institute has contributed two chapters to the book. One chapter looks at Sir Richard Church (1784-1873), an Irish Anglican from Cork who became commander-in-chief of the Greek army during the war of independence in the early 19th century, and later became a life Senator in Greece. His second paper tells of the story of the Revd Robert Stewart from Dublin, his wife Louisa, and their family, who went to China with what is now the Dublin University Far Eastern Mission, and were martyred in 1895. The Waterford-based writer Dr Rachel Finnegan has contributed two chapters, looking at the 18th century ‘Grand Tours’ of Thomas Miles, Bishop of Waterford and Lismore, and his nephew, Richard Pococke, later Bishop of Ossory and of Meath. Angela Byrne of the University of Greenwich recounts the sisters Martha and Katherine Wilmot from Glanmire, Co Cork, who made a pilgrimage to Russia in 1806. Emmet Jackson traces the Holy Land pilgrimage of Lady Harriet Kavanagh from Borris, Co Carlow, in 1846-1848. Sarah Hunter of Trinity College Dublin writes about the Dublin University Mission in Bengal. Kerry Houston of the DIT Conservatory of Music sketches the life of the Revd William Sandford Pakenham-Walsh (1868-1960), a missionary in China. The previous two volumes, published in 2012 and 2013, were edited by Professor Ryan and Dr Brendan Leahy, who is now Bishop of Limerick. A box set of all three volumes was presented recently to Pope Francis in Rome by Father John-Paul Sheridan.